As nature photographers we have to be ready and willing to shoot in any conditions if we want to get the shot. 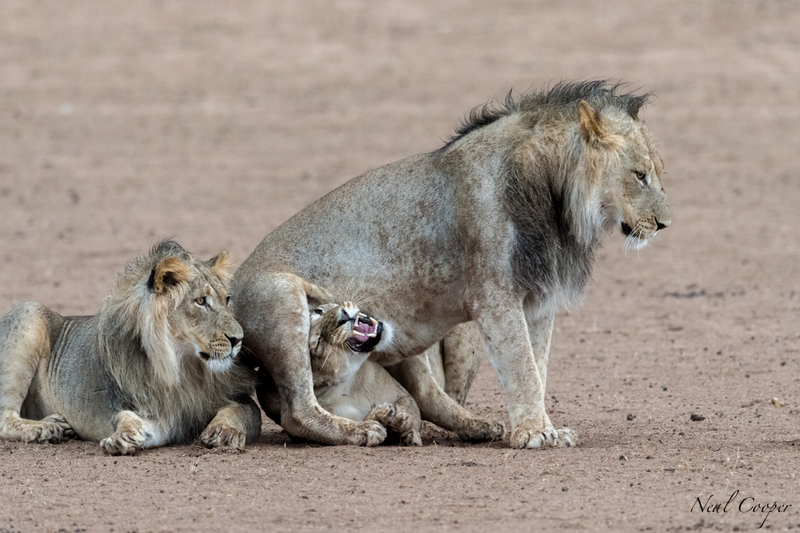 In this particular sequence I want to share with you, I was in the Kgalagadi Transfrontier Park in December a year ago when we were challenged photographically. The day started off as you would expect from a Kalahari summers day i.e. sunny and hot but as the day dragged on so the thunder clouds started to build. This is a normal occurrence in the Kalahari areas of Southern Africa during summer, but normally I would feel that this will be another wasted afternoon session without good golden light and a session that is going to require a lot of thought and concentration to get the shots. These overcast and rainy conditions did not keep me in camp and we headed South from Urikaruus down the Auob River bed towards Gemsbokplein. Some where near Batulama at around 17:30 we spotted two male lions and a single female as they lay in the soft rain, probably just having woken up from their sleep. As soon as the temperature drops or it starts to rain the large predators will also become more active. 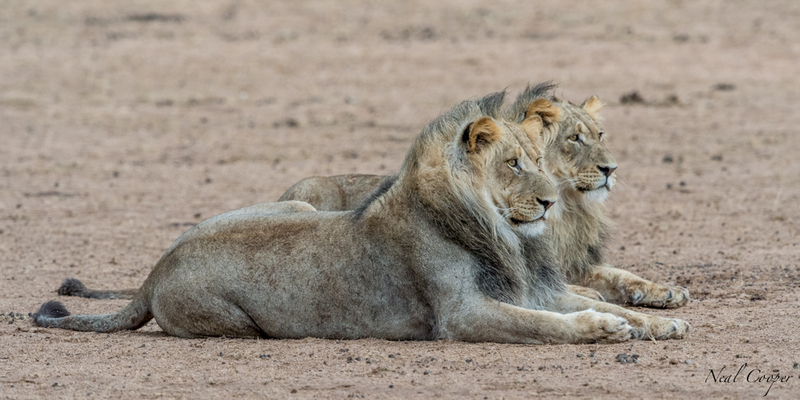 I positioned the vehicle so that we would get a good view of the lions. In this sequence I was using my Nikon D4 with a Nikon 600mm plus 1.4 extender. For stability, the camera and lens was supported on a large beanbag. The immediate issue was that the rain, although soft was continuing to fall onto the equipment. I know the pro equipment can take a few drops, but in my mind I saw disaster and at first I grabbed a towel and covered the lens, but this soon became wet as well so I switched to a good old black bag. Secondly I wanted to ensure that I got the shots without having to push the ISO too high. I tend to want to shoot at maximum shutter speeds to limit camera shake and freeze the action. In these images I was shooting at ISO 1600 and with an exposure compensation setting of minus 1.0. The Nikon cameras handle this negative setting beautifully and if I did not use this I would have had to up my ISO another few clicks which I did not want to do. You really going to try and catch a Springbok? The Lions were playful with the one very obese male Lion even sitting on top of the head of the poor female, who was needless to say not very happy. 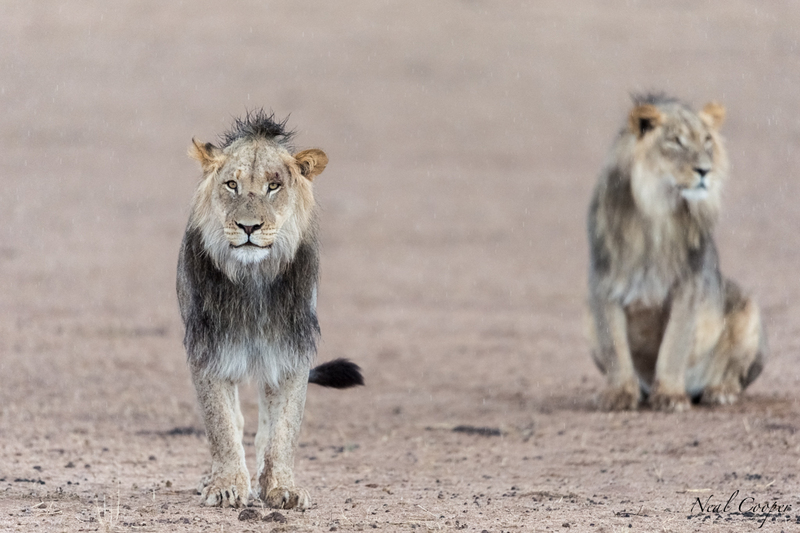 At one point the males just sat in the rain looking ahead, probably planning the evening’s festivities. The Lion slook unsure if they are annoying the rain. The obese Lion even tried to go after a herd of Springbok, who were very aware of the Lions and easily avoided the charge. In the image you can see slight movement of the left front paw, which would probably have been eliminated at a shutter speed of 1/800 if a second which I did not have here. 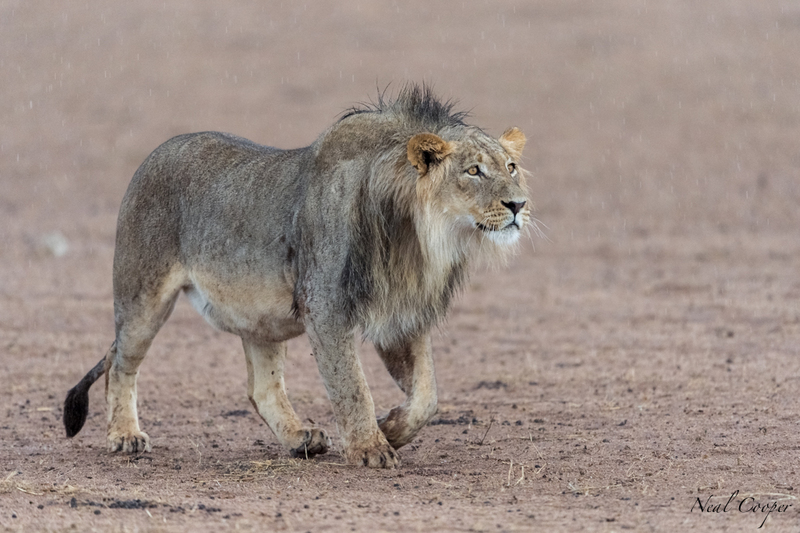 But the colors of the wet Lions and the falling raindrops adds to the mood of the image. To increase the amount of light I removed the extender and opened up the lens all the way to f/4.0 to manage the shutter speed to a maximum of 1/320 of a second. I also lost the option to have the whole Lion in focus as the focal plane had reduced to a few centimeters. I decided to keep focus on the head of the Lion ensuring that I get the head and specifically the eyes in focus. 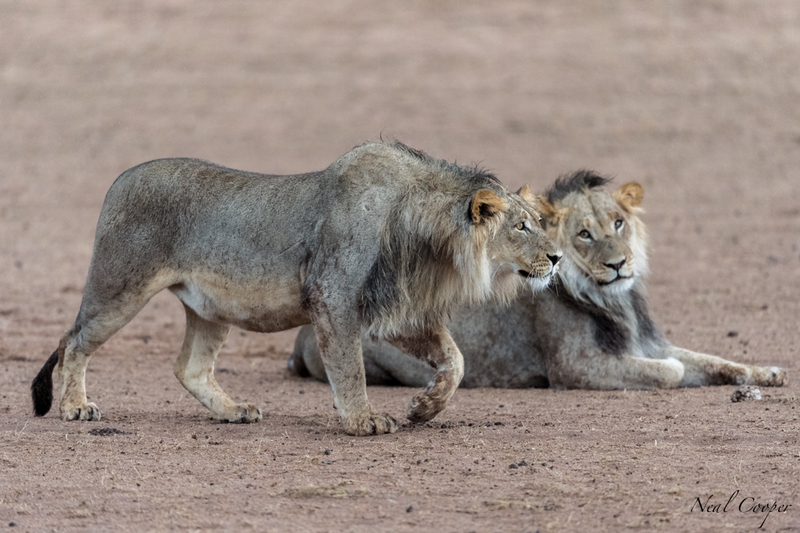 The male Lion tries again to get closer to a herd of Springbok. So when the weather turns, you don’t have to stay indoors, but simply work your camera and you will get a few magic images from the session. Neal, your sequence is superb. I love the colours of their coats.Great work!! Jacques. You are 100% correct in saying you can only get to f5.6. When I achieved f4.0 I was on a straight 600mm without the extender. I have not tested the 7.1 claim but don’t really pay attention to the claimed sharpest f stop for a lens when I am trying get get the most shutter speed at an f stop I want, to ensure the subject is sharp everywhere, at the best ISO setting. The lenses at the top end are so good that I believe the sharpness from one f stop to the next is negligible when shooting at low shutter speeds. Thanks for yor comments Jacques. Hi Russell. Yes I do have them but had left them in another bag at the camp. Now they stay in my vehicle.